Turn-Key Installations - Fully Warrantied! 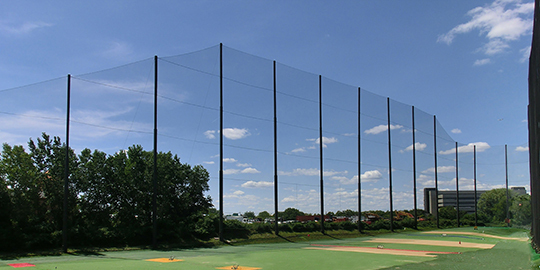 Whether you are a facility, or a private homeowner, Golf Range Netting will provide you with a superior design and turn-key installation your Driving Range Netting or Golf Netting Enclosure. All of our materials are top-quality, Made in the U.S.A., designed for high impact, indoor and outdoor use. Our installations leave minimal impact to the property we are working on, and we provide a comprehensive warranty for our structures – all of it – not just the materials. Our driving range netting is built to outlast our competitors and withstand elements for years to come. We not only design and install new structures but if you need to replace your range netting, we can do that too. Our commercial driving range netting installations are all custom fabricated for your sites needs.